My husband is a web developing genius, so he moved my site here. He also suggested maybe it’s time to give an update on how I’m doing. I’ve had kind of a rough six weeks or so. I mentioned in a previous post that back in August or September my GI doc had been very impressed overall with my progress, but wanted me back on antibiotics briefly before removing my final drain. When I went to my follow-up appointment (when my last drain was supposed to be removed) and reported that I still felt some swelling and occasional fever, he ordered an MRI. The results were a little disappointing. No new abscesses or fistula tracts were found (which is the good news), but the bad news was that the main fistula tract was still pretty giant. So, I had another surgery (#6!) and this time my surgeon opened the fistula all the way so that it could drain and hopefully close up with healthy tissue. When I went into this last surgery, I thought it would be like my previous ones–three or four days down and then a slow return to normal. But the incision was much bigger than any of my previous ones. Poor Chris (who might as well be a nurse in addition to a web developer by now) had to pack the incision with clean gauze several times a day for a few weeks. It was not fun for either of us. After two weeks I was still very uncomfortable and unable to move around too much. Now it’s been almost three weeks and I’m finally starting to feel well enough (and painkiller free enough!) to get out of the house a little. I’m going to start a new medication to see if it gives me better results and gets that last bit of healing under way. I also started some new supplements–a probiotic, vitamin D, and folic acid–at the suggestion of another doctor after she ran some blood tests and found that I was extremely deficient in some vitamins, in spite of all that I do to eat a really nutrient-dense diet that should provide plenty of these and other vitamins. Needless to say, all this news was not what I had been hoping for. But, my surgeon and GI doc both said that we are still moving in the right direction, just maybe not as quickly as we might hope. So I’m doing my best to focus on that. Anyway, this has given me a good excuse to watch Every. Single. Christmas. Movie. Ever. I’ve also gotten to spend lots of time admiring our tree and cuddling our greyhound. And finally this weekend I felt well enough to do a little Christmas baking! 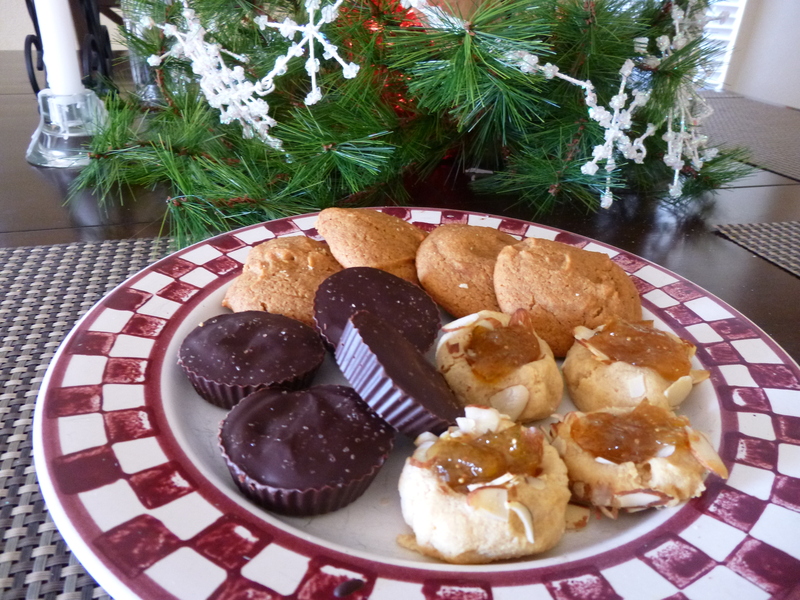 This way I can bring my own desserts to share to Christmas festivities and that might help me keep my paws out of all the goodies I shouldn’t be eating right now. I thought I would share a couple of recipes so that you can treat yourself or a loved one with dietary restrictions as well. The orange ginger spice cookies are fragrant, soft, and chewy, even after they cool down. The peanut butter cups are rich–just as they should be. Also pictured are the thumbprint cookies from Danielle Walker’s ebook Joyful, which you can get as a Kindle version for only $1.99. I made them just as instructed and they are both pretty and tasty! 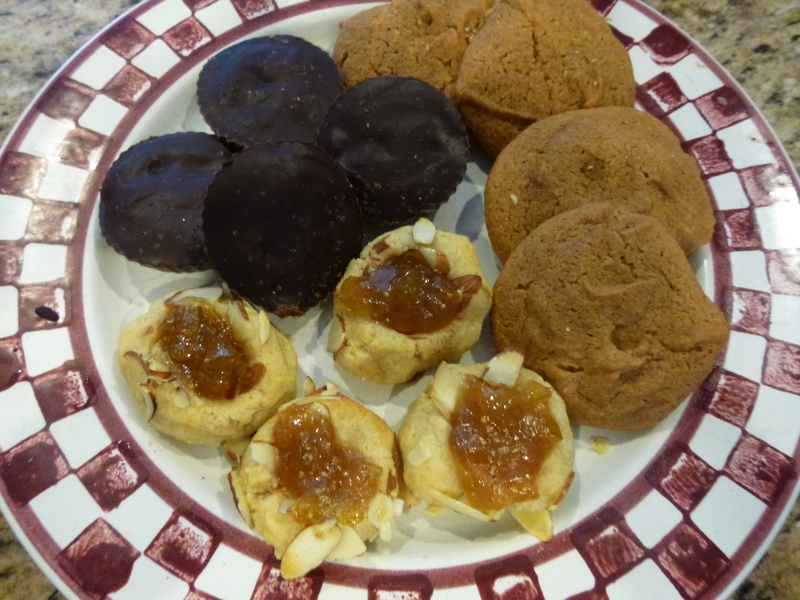 The ginger cookies and thumbprint cookies are both paleo and SCD legal. The peanut butter cups are all around a little illegal. But all three are grain-free (and by default gluten-free) as well as free of refined sugars. 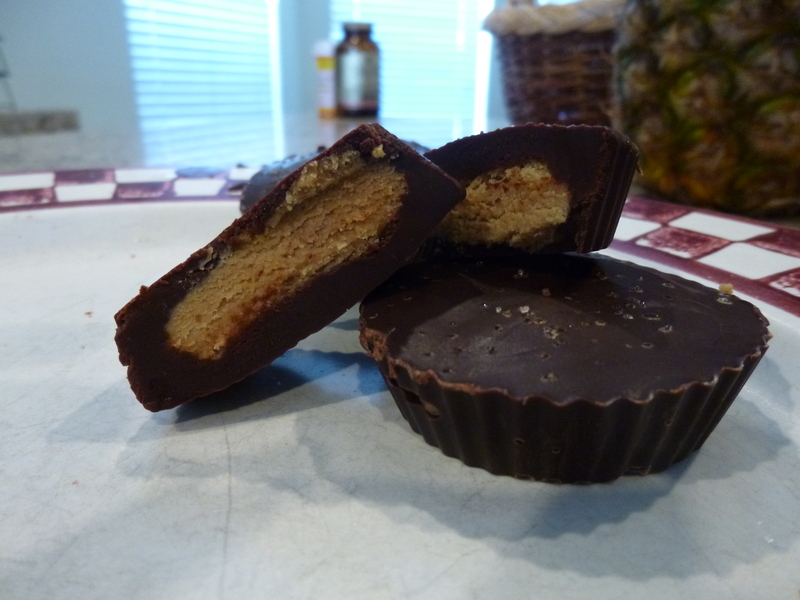 The peanut butter cups are egg free and dairy free. Both the peanut butter cups and the ginger cookies can be made nut-free if you substitute sunflower seed butter for the nut butters. 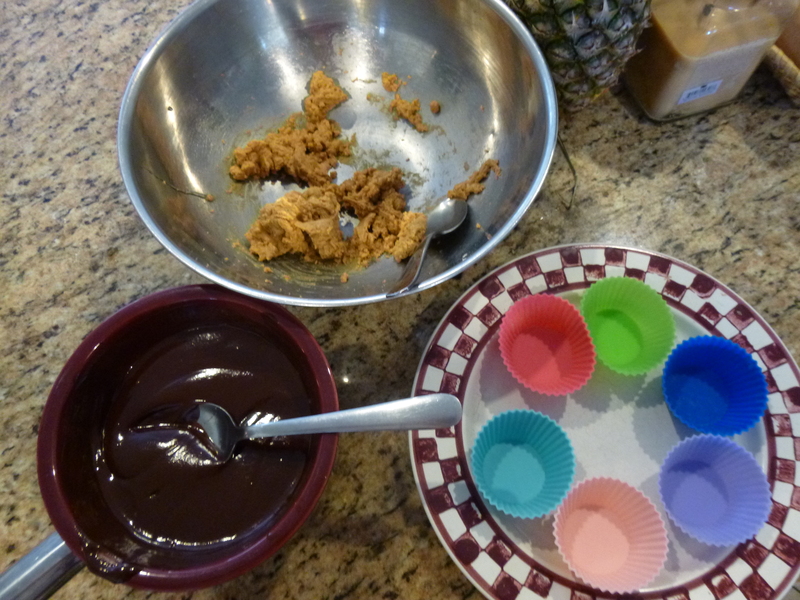 Here is the process for assembling the peanut butter cups: a little chocolate, a little peanut butter, a little more chocolate! Here is the finished product. Yummmm. Santa could appreciate this plate, even if he has IBD or has gone paleo since last year! Preheat oven to 350 degrees Fahrenheit and line a cookie sheet with parchment paper. Combine butter, almond butter, honey, egg, vanilla extract, and orange zest in a large bowl. Use a hand or stand mixer and mix until smooth. Drop batter by spoonfuls onto parchment paper. Bake 12-14 minutes. Cool on cooling rack. First make the peanut butter filling. Combine the peanut butter, 2 tablespoons honey, coconut flour, and sea salt. Use a hand mixer to stir until well combined. Divide into 10-12 balls by rolling between your palms, and then flatten a little into discs. 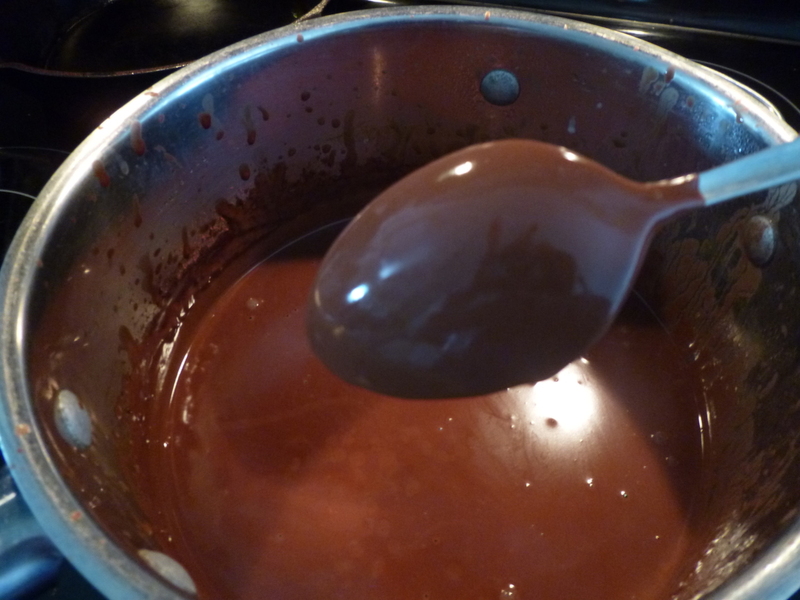 To make the chocolate, combine chocolate and oil in a heatproof bowl. Set on top of a saucepan with about 1 inch of simmering water in it. Stir until melted. Remove from heat and add in remaining 4 tablespoons honey and vanilla. Stir until smooth. Spoon a little chocolate in the bottom of a silicone cupcake liner and swirl to coat the bottom and up the sides just a bit. Then drop in one disc of peanut butter. 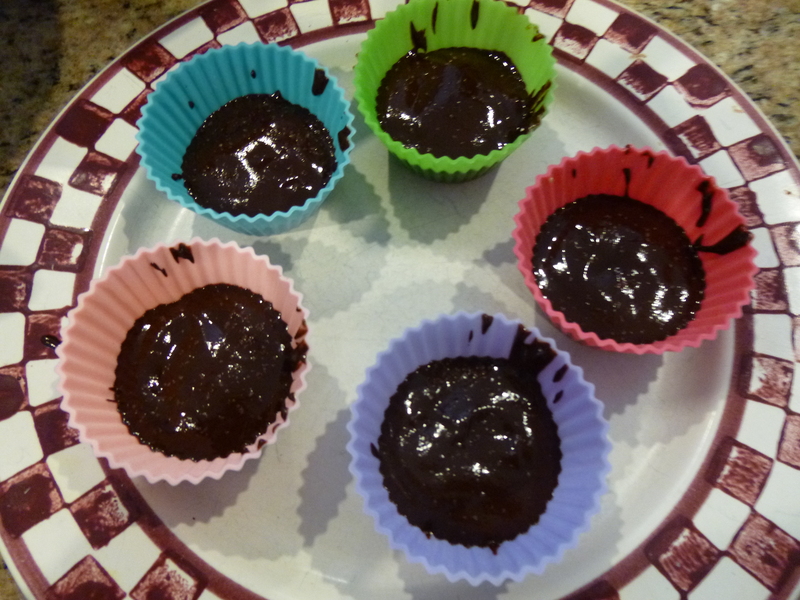 Top with more chocolate to cover and a pinch of sea salt. Refrigerate several hours, until set. Gently peel off the silicone liner. Store in the fridge. *The cocoa makes these not 100% SCD legal but in my estimation these are still much better than most standard treats. To make them paleo compliant, just switch out the peanut butter with sunflower seed butter or your favorite nut butter. 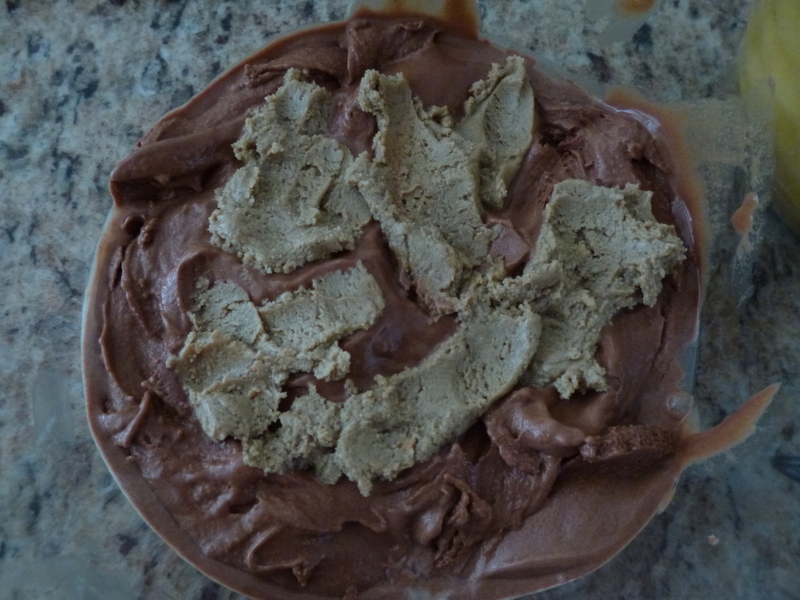 Dairy Free, Nut Free Peanut Butter Swirl Chocolate Ice Cream! I might have mentioned like…once or twice…that I really love ice cream, but for multiple reasons I know that normal ice cream is absolutely one of the worst things I can eat. Still, a lifetime without ice cream is not an option. My parents came to visit for the 4th of July, and I asked them to bring their ice cream maker with them, because a) 4th of July = homemade ice cream to me, and b) I had been seeing some very tempting SCD-legal ice cream recipes floating about, but they all required an ice cream maker. 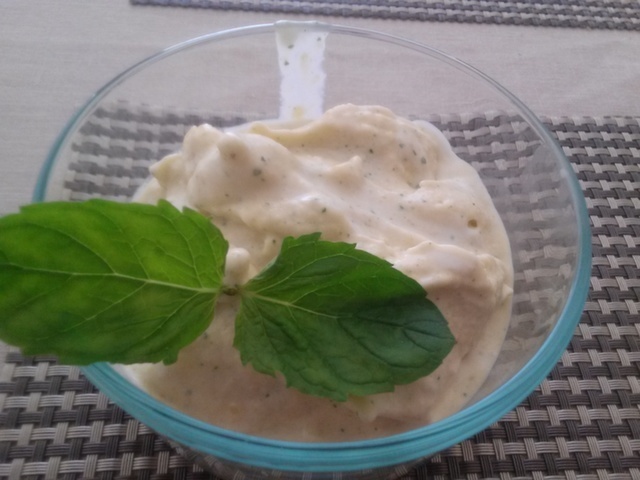 The weekend of the 4th, I made Danielle Walker’s vanilla bean ice cream from her cookbook, Against all Grain. It was simple and so fabulous. We couldn’t get over how much it tasted like the real thing. My parents left the ice cream maker in my temporary custody. 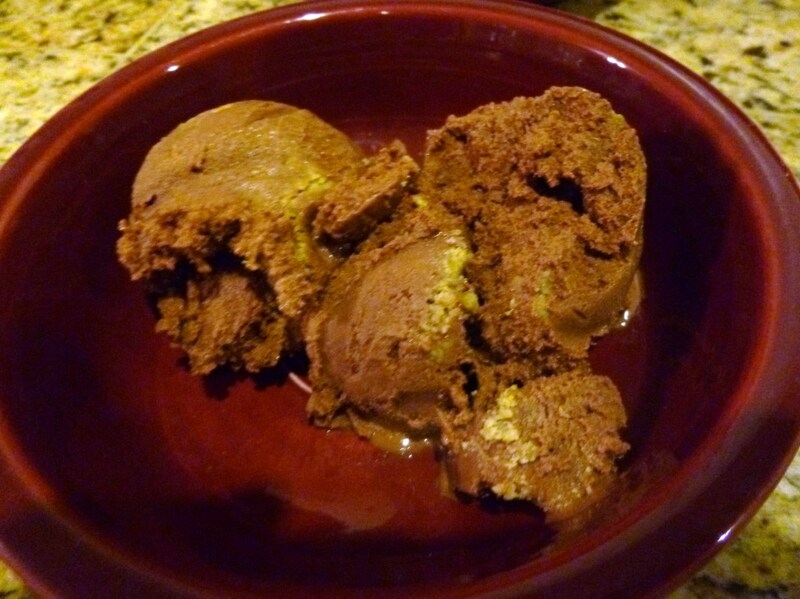 If you love ice cream and suffer from IBD, you should just get an ice cream maker. I always thought that would be one of those gadgets that junked up your space and that you only pulled out once a year, but let’s be real, now that I can’t get my ice cream fix any other way, I’m sure it will get a regular workout. You can find them for around 50 dollars and they will provide you with a lifetime of frozen treats. CHOCOLATE ICE CREAM WITH A PEANUT BUTTER SWIRL!!!! I know it seems too good to be true. But seriously, try it. Technically this is not SCD-legal because of the cacao, but I’ve already expressed my feelings on that front elsewhere. 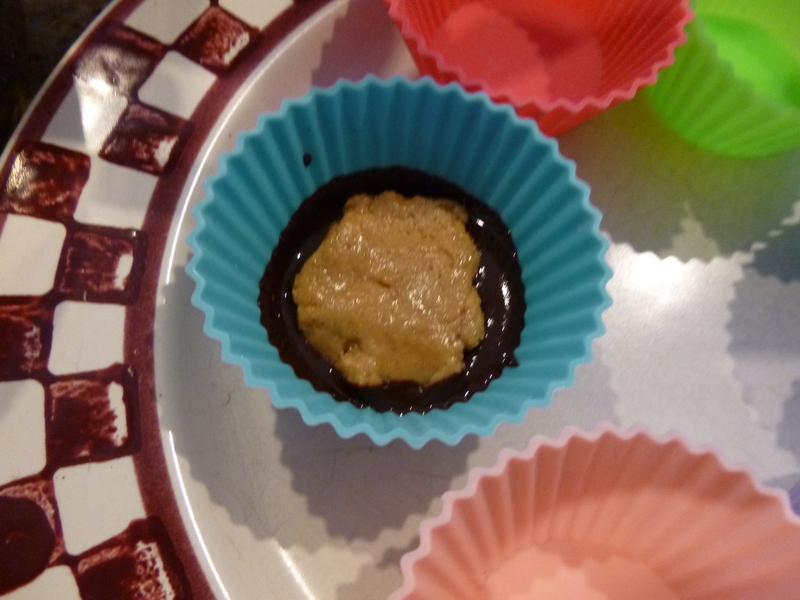 It is so rich, not overly sweet, and I love the little salty swirl of “peanut” butter combined with the chocolate. One time Chris ate a whole jar of peanut butter while his mom wasn’t home and then got sick (duh). He told me after eating this (and his burger and half of mine, and sweet potato fries, and a few beers…) that maybe the peanut butter was too much after all that other stuff. It was only then that I broke it to him that it wasn’t even peanut butter! Cover it this way so your custard doesn’t form a gross skin. 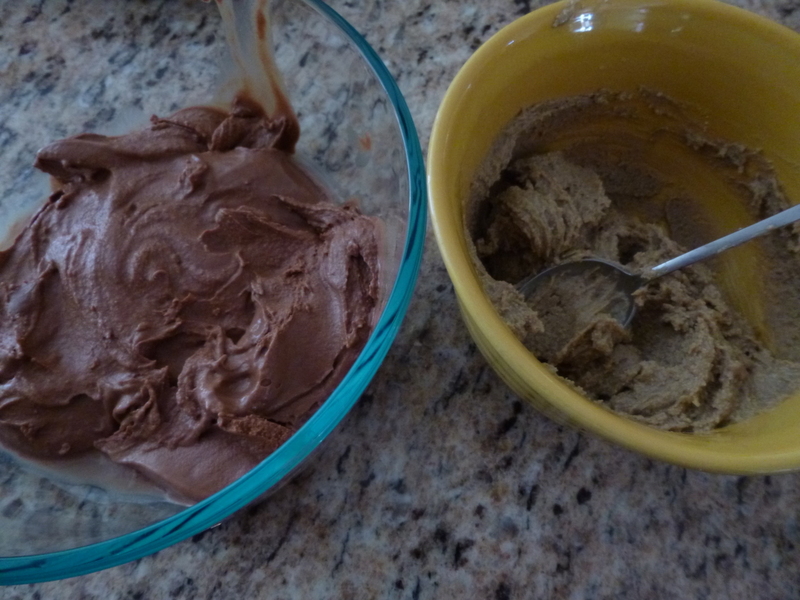 Layer your frozen ice cream and nut butter. Once you get the layers in there swirl it around. You don’t want to mix it so much that the nut butter just dissolves into the ice cream, but you also don’t want giant chunks of it in there either. So I had had like two glasses of wine when I took this picture. Sorry guys. It clearly affected my (already poor) photography skills. This does not do justice to how delicious the ice cream looked in real life and tasted. Heat over medium-high heat, stirring constantly, until the custard coats the back of a spoon. This takes about 15 minutes. Be careful not to let the mixture boil. Remove from heat. Add vanilla extract. Taste and adjust by adding a bit more honey or cacao to your liking. Cover with plastic wrap so that it actually comes into contact with the top of the custard and refrigerate until cold, about 4 hours. You can do this the night before making your ice cream, if you’d like. Pour into your ice cream maker and freeze according to the manufacturers’ directions. In the meantime, combine sunflower seed butter, sea salt, and remaining honey in a small bowl. Microwave about 20 seconds to soften and combine thoroughly. When the ice cream is frozen, scoop 1/3 out into a freezer-safe air-tight container. Place half the sunflower seed butter mixture on top in dots. 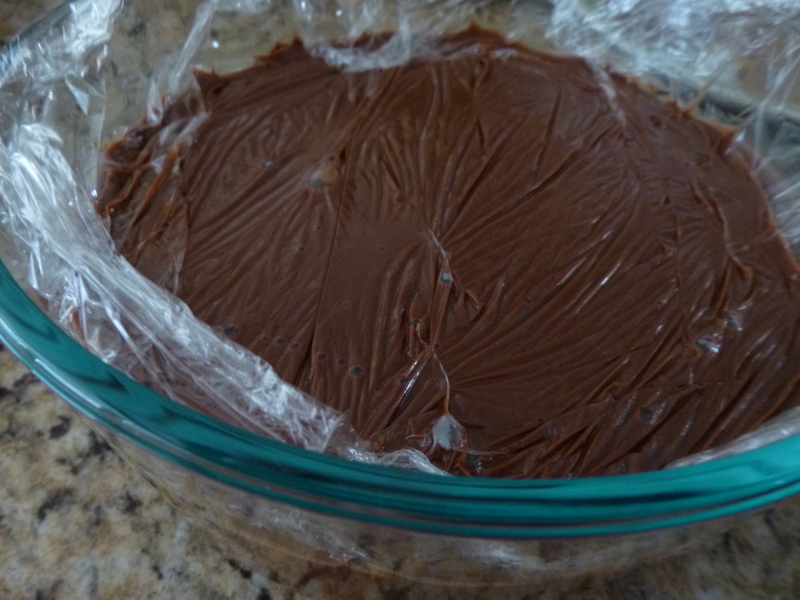 Repeat the layers until all ice cream and all sunflower seed butter is used. Swirl with a knife. Cover again with plastic wrap and lid and freeze for 2 hours to cure. Before serving, set out for about 20 minutes to let it soften a bit. Ok, you guys, I know what I’m eating for the rest of the summer. In the rest of the northern hemisphere, it might be a season called “spring” right now. But in the desert, we have moved right on to summer. I already feel like just skipping meals altogether and only consuming cold beverages and smoothies until October. But my biggest illegal craving has been ice cream, frozen yogurt, gelato…I’m dying for it, but I know how much I will regret indulging afterwards. So, I’ve come up with a sweet and refreshing frozen treat that is based mostly off of actual frozen fruit. I mean, I’m not going to lie; it’s not my old favorite Karamel Sutra (sigh) but it also doesn’t leave me feeling like I’m going to die every time I eat it. First blend up the cream with the mint and honey. Once you add the fruit you really don’t want to over-process because the food processor motor will heat up and melt it. Done! Seriously, how easy was that!? 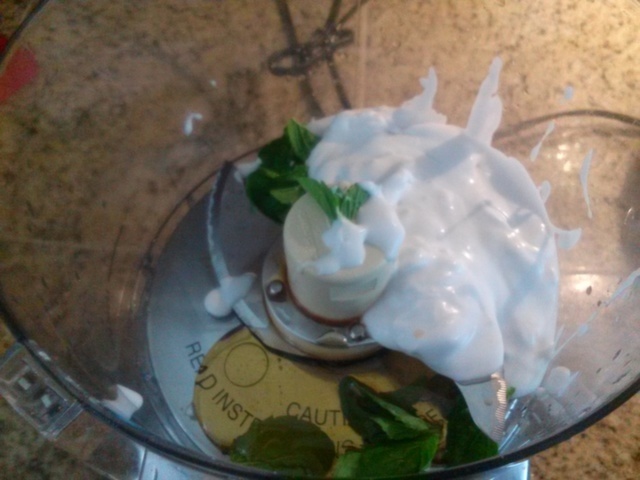 Combine coconut cream, mint, honey, and vanilla in food processor and process until the mint is well incorporated. 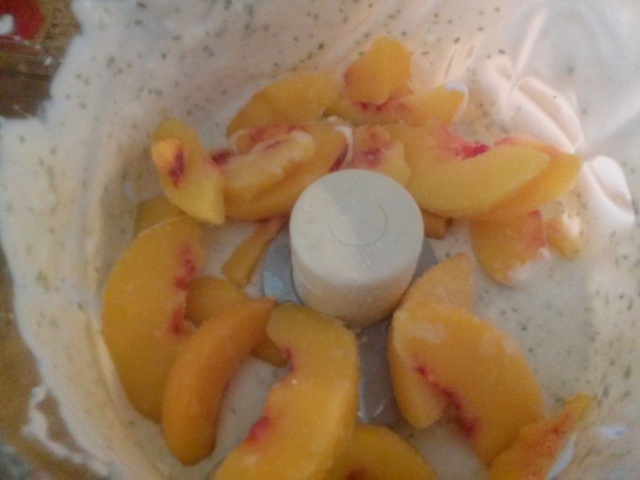 Add the frozen peaches and process until smooth. My mom was recently telling me about how my grandma can’t eat raw fruit anymore, and how much she misses it. Since I’m in the same boat, I started thinking about how to work in cooked fruit. 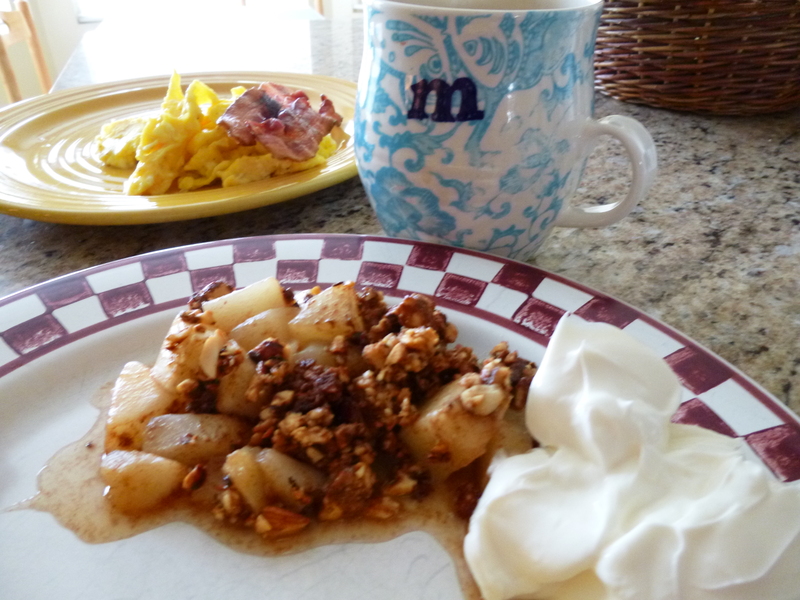 I came up with this easy baked pear dish that is perfect for breakfast served with yogurt or even as a light dessert. While that’s baking, prepare the fruit. Here’s what you’ll need. And here’s what it will look like ready to go into the oven. 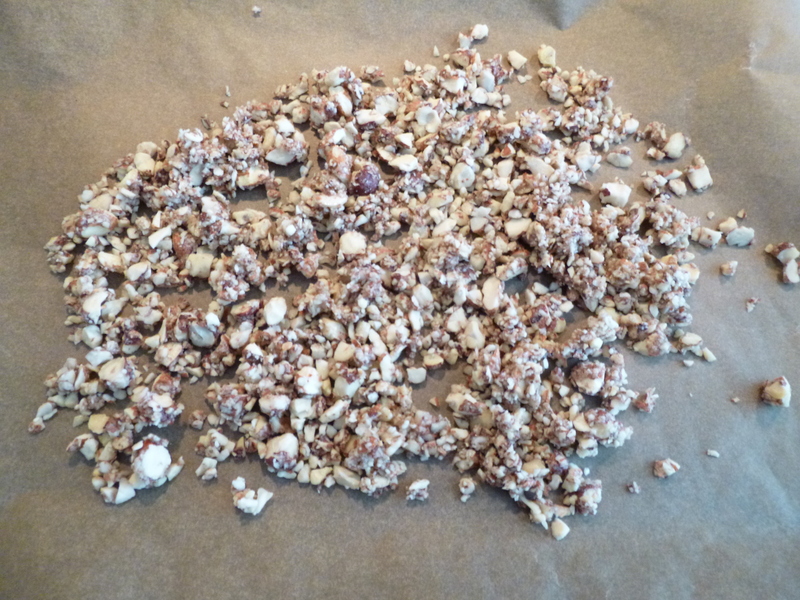 Add all ingredients for the sea salt nut crunchies to a food processor with the blade attached. Process until they are broken down a bit but not yet turned into a nut meal. Spread mixture on a parchment paper or silicone mat-lined cookie sheet and bake for 15 minutes, until they are fragrant but not browned. Resist the urge to eat all the warm nuts, but go ahead and eat a few because they are reaalllyyyyy good. 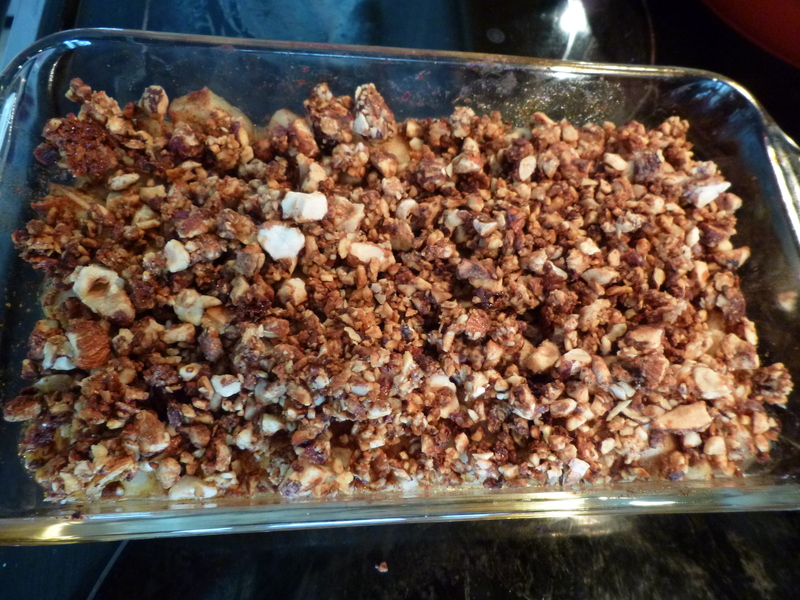 While nuts are baking, combine all ingredients except for butter in a small casserole dish. 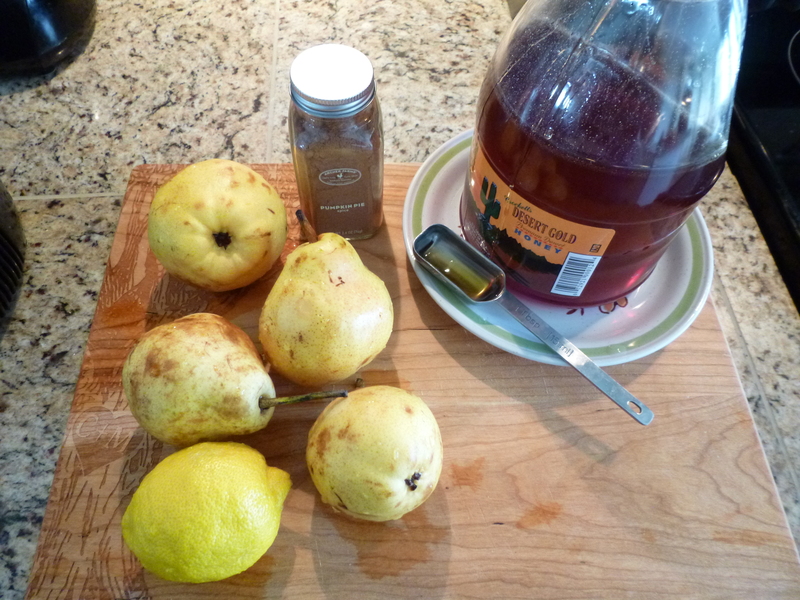 Resist the urge to gobble up all your spiced pears raw. Place the pieces of butter on top. Turn oven up to 350 degrees Fahrenheit. 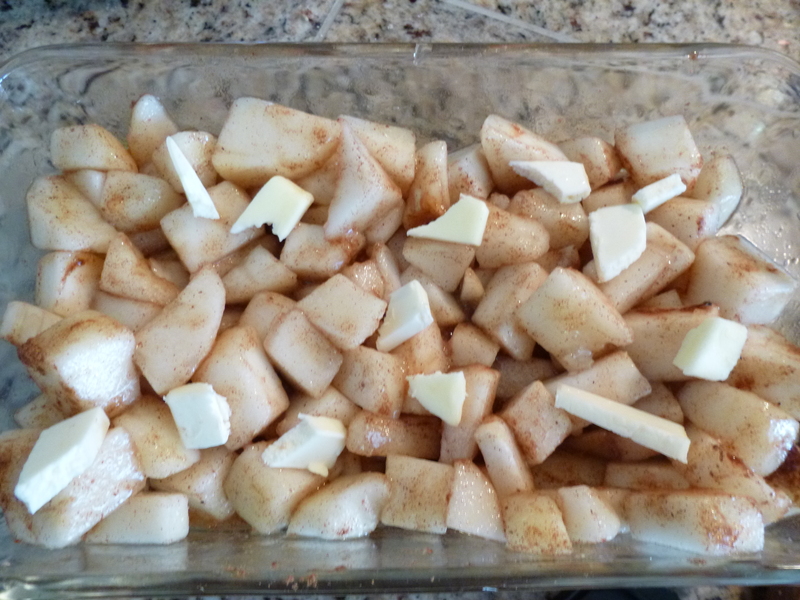 Bake for 30 minutes, until fruit is soft and liquid is bubbling. Top with nut mixture and serve plain or with yogurt.